In 2018, biologists observed the invasive plant Parthenium, known locally as congress grass, establishing itself in grasslands of India’s Pobitora National Park. Invasive species threaten protected areas in Assam state, and herbivores like the greater one-horned rhinos that live within them, by crowding out the native plants animals rely on for food. Each of Assam state’s four rhino reserves currently faces threats from invasive plants including Parthenium, Mimosa, Mikania and water hyacinth. Experts are contemplating the use of several strategies to tackle invasive plants, including manual removal and the introduction of biological control agents such as the Mexican beetle that feeds on Parthenium. On a gloomy afternoon in May 2018, conservation biologist Bibhab Talukdar was visiting Pobitora National Park in Assam. As he rode an elephant into the grasslands at the core of the park he was met with an alarming sight: a luxuriant growth of a low, bushy herb with small green leaves and creamy white flowers. Locally known as ‘congress grass’, this plant, Parthenium hysterophorus, is native to the Americas and an alien species in India. Talukdar, the chair of the International Union for Conservation of Nature’s (IUCN) Asian Rhino Specialist Group and CEO of the NGO Aaranyak, said he was worried because Parthenium is a highly invasive plant with a history of damaging local ecosystems in more than 20 countries around the world. Australia is the prime example, with vast swathes of native rangelands and summer crops under pressure from the weed. 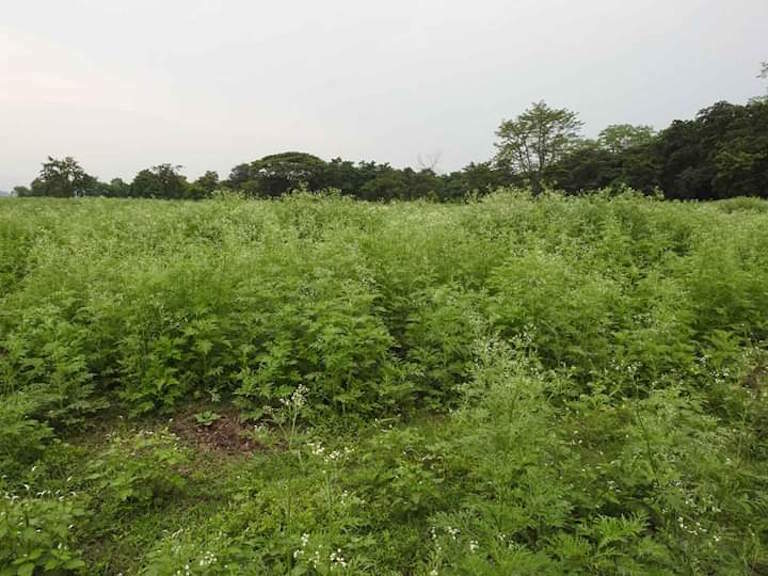 If its spread in Pobitora isn’t checked in time, Talukdar said he believes Parthenium could spell trouble for the park’s 102 greater one-horned rhinoceroses (Rhinoceros unicornis) by smothering the native species they feed on. Parthenium can be seen growing vigorously in the grassland areas inside Pobitora National Park. Conservationists are worried the invasive weed will crowd out native fodder plants. Photo courtesy of Bibhab Talukdar. It’s not clear how and when exactly Parthenium arrived in India. The popular theory is that the seeds arrived in the 1950s, piggybacking on consignments of grains imported as part of a U.S. government food-assistance program. The weed was first reported growing on trash heaps in 1956 in Pune, in the state of Maharashtra. Although Parthenium was first spotted in Assam in the 1980s, it had not previously been reported in the core areas of Pobitora. Nine years ago, when Talukdar visited the park as part of a team of researchers that studied the status and distribution of invasive plants in the rhino habitat, such Parthenium growths weren’t observed. “Its arrival in the park seems to be recent,” he said. Parthenium is just the latest addition to half a dozen invasive plants colonising rhino ranges across Assam, which harbours more than two-thirds of the world’s one-horned rhino population in four protected areas. According to a 2011 article in the journal Pachyderm, the already established invasive plants in Assam’s rhino ranges are Mimosa invisa, Mikania micrantha (the “mile-a-minute” vine), Chromolaena odorata (Siam weed) and Ipomoea carnea (pink morning glory). All were identified in India’s Fifth National Report on Biological Diversity in 2014 as invasive plant species responsible for harming local ecosystems. A Chromolaena infested area in Manas National Park. Chromolaena is replacing native vegetation in the park. Photo by Bikash Kumar Bhattacharya. “You’ve got to add Parthenium, Eicchronia carssipes [water hyacinth] and Lantana camara to the list,” said Iswar Chandra Barua, a professor of agronomy at Assam Agricultural University in Assam’s Jorhat district. Barua, who has been studying the dynamics of phytoinvasion in Assam for over a decade now, said that all four of Assam’s rhino reserves — the national parks of Kaziranga, Orang, Pobitora and Manas — are currently reeling under attack from these invasive plants. Each presents a unique danger, Barua said. Siam weed and water hyacinth are “driver species,” capable of decimating native plants without any assistance from accompanying environmental change; Parthenium and Mimosa possess tremendously high competitive ability, known as allelopathy, which inhibits the growth of indigenous plants in areas colonised by these weeds; Ipomoea stems form thick mats that block natural water flows, making it the most troublesome aquatic weed after water hyacinth, which is notorious for clogging water bodies; Lantana exudes poison from its roots, killing off native flora; Mikania produces around 40,000 seeds every year and colonises forest areas at a very rapid pace by choking and smothering grasses and tree saplings. “Hundreds of indigenous plants, including the rhino’s favourite fodder species, are under direct pressure from these invasives,” Barua said. 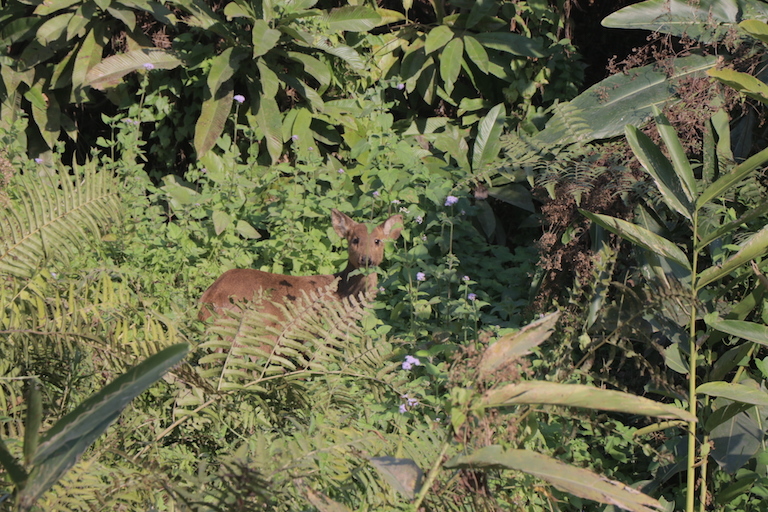 An Indian muntjac, also called barking deer, is seen grazing in an area inside Orang National Park where Chromolaena has started to infest. Photo by Bikash Kumar Bhattacharya. In Kaziranga National Park, home to 2,413 rhinos per the 2018 census, Mimosa can be seen overrunning natural grasslands in several ranges. However, the situation has improved since the early 2000s, when the problem was more acute. Barua credits the natural floods that have hit the park in recent years. “During the annual flood, the entire park remains inundated for days and sometimes weeks. This works somewhat as a natural check on the growth of Mimosa,” he said. However, a potential threat lurking on the park’s doorstep is Ludwigia peruviana (Peruvian water primrose). A 2017 study led by Barua found that this semi-aquatic weed has damaged already around 200 square km of marshland plant communities in Karbi Anglong district, where part of Kaziranga is located. 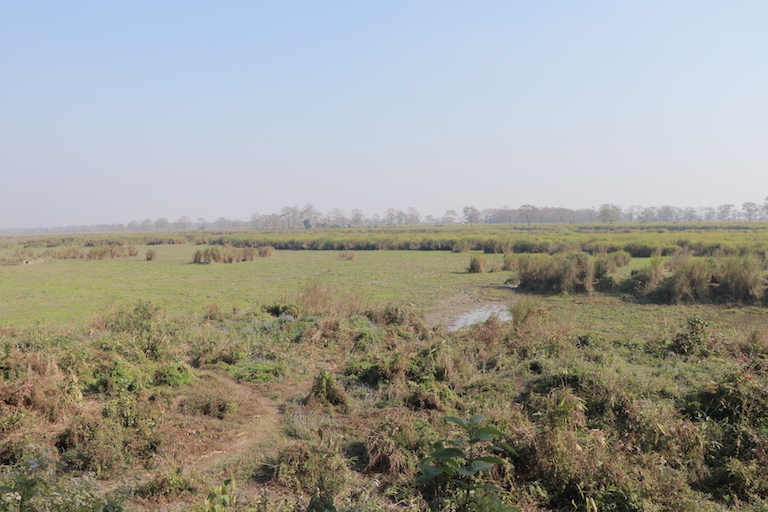 He said Ludwigia will likely infest Kaziranga marshlands if no measures are taken to check its spread. 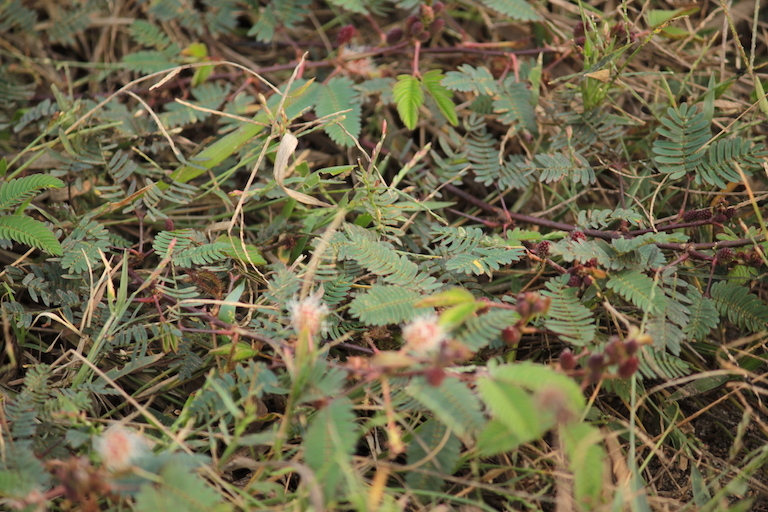 Mimosa plants in Orang National Park. The plant is believed to be responsible for a decline in the park’s wet alluvial grassland. Photo by Bikash Kumar Bhattacharya. In Orang National Park, home to 101 rhinos, Mimosa appears to be the most severe current threat to the ecosystem. From 1987 to 2008, Orang saw its wet alluvial grassland shrink by 12.8 percent, and dry savanna grassland and degraded grassland increase by 9.25 percent and 6.51 percent respectively, mainly due to the impact of Mimosa, according to a 2011 study on land cover change in the park. 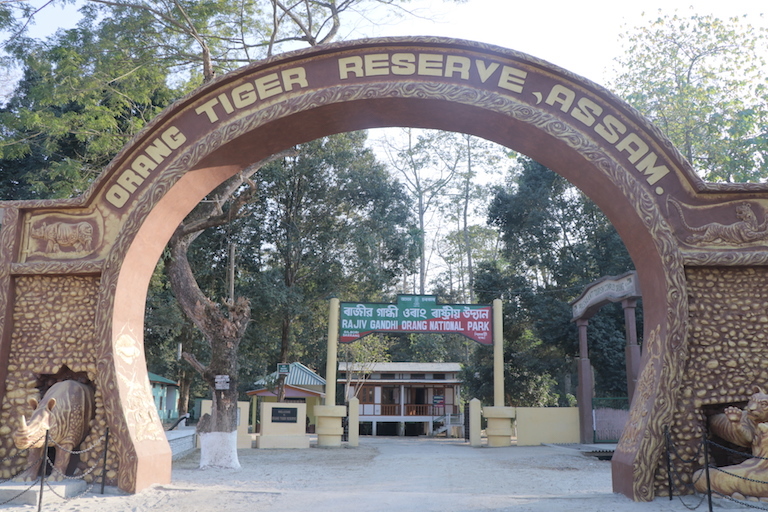 Manas National Park is also experiencing a phytoinvasion, with Chromolaena and Mikania infesting large patches of forest. With a density of 9.4 to 15.1 plants per square meter, according to a 2004 survey, Chromolaena is overrunning areas of already-degraded vegetation along the southern border of the park, while Mikania is colonising riverine grassland patches and forest edges. 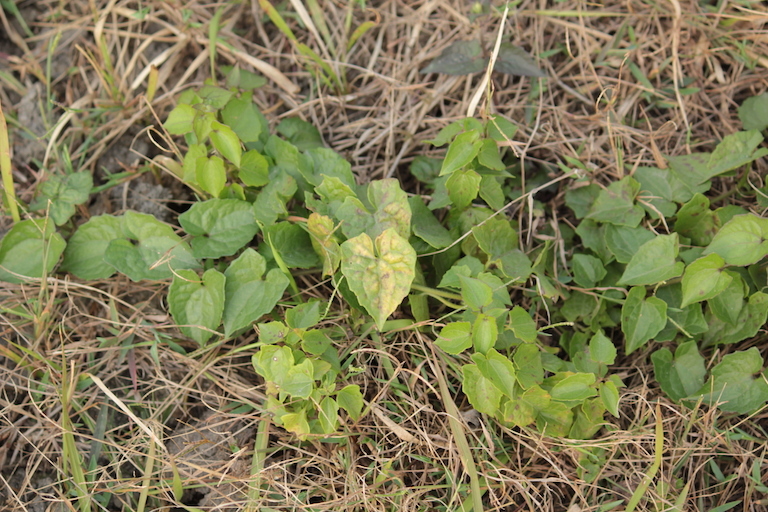 In Pobitora National Park, the biggest threat is Ipomoea, primarily a coloniser of grasslands. The spread of Ipomoea inside the park has sparked competition among indigenous grass species and the weed for space and nutrients. In addition, as Talukdar observed, Parthenium is an emerging challenge. Over the last year, the weed has been seen spreading alarmingly along the park’s grassland areas. Mikania plants in Orang National Park. Mikania has also been identified as a threat in Nepal’s Chitwan National Park, home to the world’s second largest population of greater one-horned rhinos. Photo by Bikash Kumar Bhattacharya. Recognising these threats, the New Delhi Declaration on Asian Rhinos 2019, signed by five Asian rhino range nations on 28 February, has mandated research on invasive species threatening rhino reserves along with other habitat parameters. A 2015 report by the Wildlife Institute of India (WII) holds invasive plants responsible for the increase in rhino straying incidents in Pobitora. The report says the rapid growth of invasive plants including Ipomoea, and the accompanying depletion of native fodder species in the park, has led to an increase in crop-raiding incidents by rhinos in villages on the park’s fringes. 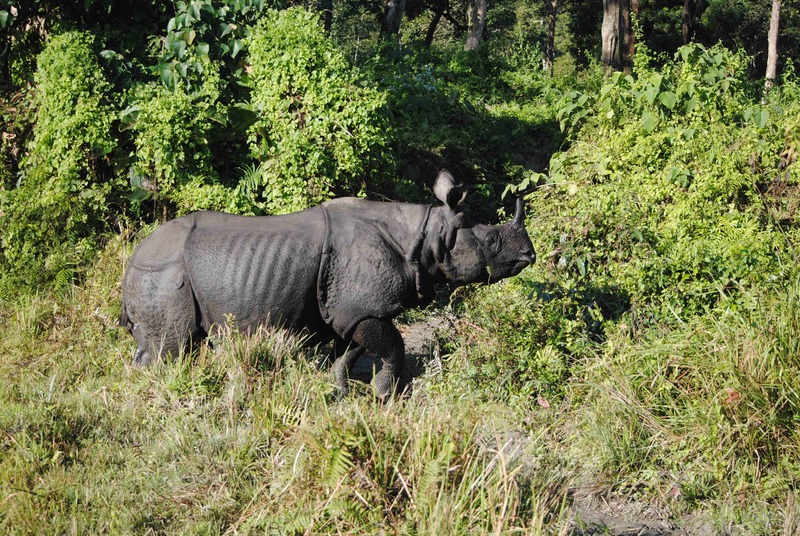 “Because the invasive weeds are choking out grasslands, rhinos are increasingly straying out to forage on crops in neighbouring farmlands,” said Mukul Tamuly, the forest range officer at Pobitora. Moreover, some invasive plants contain toxic compounds that can harm rhinos and other herbivores that ingest them. “Lantana camara, for example, contains pentacyclic triterpenoids, a hepatotoxic compound known as lantadene. If rhinos feed on lantana leaves, it could inflict significant liver injuries on them,” Tamuly said. A greater one-horned rhinoceros in West Bengal state’s Jaldapara National Park. Invasive species including Mikania are also found in that state’s rhino reserves. Photo by Udayan Dasgupta. Plants that become successful invaders are fast-growing and highly adaptable to new environments. When they are transported to ecosystems where their natural predators are not present, such species can rapidly overrun indigenous plants. Due to their higher phenotypic plasticity — the ability to develop differently in different environments — invasive plants can adapt to environmental fluctuations. This helps them spread and establish in new areas. Rajkhowa cites the example of Mikania, which is now seen growing in a range of habitats from terrestrial to littoral. Moreover, many invasive plants are cryptic in nature and have the ability to go undetected for years, or their damaging impacts are not immediately clear, making it difficult to control these species. Degraded forest patches such as this one in Orang National Park, are particularly prone to phytoinvasion. Photo by Bikash Kumar Bhattacharya. Given these challenges, there are three methods to control invasive plants: mechanical removal; spraying chemicals; and using biological control agents. The mechanical removal method, which involves hand weeding, is the simplest way, but is labor-intensive, expensive and has to be repeated consistently. It is widely used in Assam’s rhino reserves, but has yielded little results. Spraying chemicals is considered unviable in protected areas as it could have disastrous effects on wildlife and the ecosystem. The biological control method, a far more complicated process that entails releasing organisms that feed on the targeted species, is touted as a less dangerous and potentially effective method. India’s Project Directorate of Biological Control (PDBC), a government agency based in the city of Bengaluru, is tasked with the responsibility of ensuring the hazard-free introduction, handling and release of biological control agents. Attempts to use biological controls against Parthenium have achieved mixed results in India: the biocontrol agent for the plant, the Mexican beetle, has shown successful results in Bengaluru, but has failed in Delhi. Orang National Park located in northern Assam is home to 101 rhinos. Photo by Bikash Kumar Bhattacharya. But the biocontrol method has its own risks: an organism introduced as a biocontrol agent to contain a particular invader may decimate other species as well, turning into an invader itself. The most infamous example of biocontrol going wrong is Australia’s cane toad catastrophe. Cane toads were introduced in 1935 to control cane beetles in Queensland’s sugarcane crops. But in the span of a few decades they spread all over Australia, causing severe damage to local ecosystems. Assam Agricultural University’s Barua said he favours exploring other alternatives. While he, too, endorses the idea of an integrated weed management plan, he said such efforts should prioritise exploring ways to use invasive plants as raw materials for local industries. There has been some success on this front. Water hyacinth has been used to make an array of products such as mats and bags; the craft now employs about 3,500 local artisans in northeastern India. Silkworm rearers in Karbi Anglong have started using Mikania as a host plant for Eri silk, for want of the primary host plant, castor (Ricinus communis). Research shows there is also potential to commercially exploit Mikania to this end, which could in turn help control the weed. Bodo tribal weavers near Manas National Park are experimenting with using Chromolaena as a natural dye, while lantana is being used as a raw material for furniture — an initiative that has seen some success in controlling the weed. This article was originally published on Mongabay.com. Banner image: A greater one-horned rhinoceros in Assam. Photo by Imran088/Wikimedia Commons.